Product Description Was born in collaboration with Crypton Future Media, it is music and 3-channel mixer for voice with useful features to web casting. 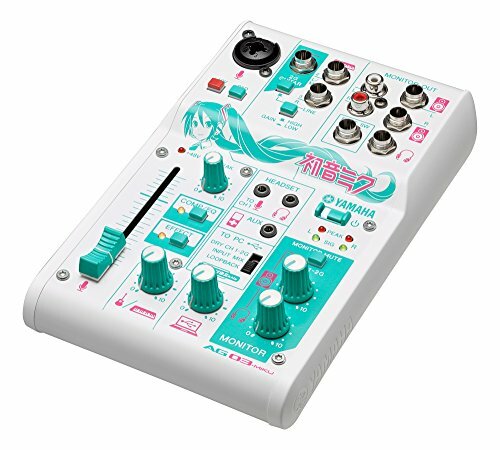 In "Hatsune Miku Trial Set" included, you can easily experience the Vocaloid song production using the voice library of "Hatsune Miku". Free sample of as "Hatsune Miku Trial Set", Crypton Future Media, Inc. to develop a virtual singer software / voice library "Hatsune Miku V3 (ORIGINAL / DARK)" 39 days trial version of, sound material "SONICWIRE", 39 days trial version of "VOCALOID4 Editor for Cubase" I have been shipped. In addition, so we bundled download license of Steinberg (Steinberg), Inc. of music production software "Cubase AI", so that you can start the Vocaloid song of production using the voice library of "Hatsune Miku" immediately. Convenient loopback function at the time of Internet delivery. Included with the "Hatsune Miku Trial Set". Because it is equipped with a preamplifier D-PRE of studio quality, it is possible to capture the sound of the vocals and instruments frankly. Equipped with large volume slider in a compact body. I can intuitively adjust the volume of the microphone in hand at the time of Internet delivery.